Currently we are booking events in the Central Florida Area only! Sweet Strings - The word Dulcimer means Sweet Music. The term Sweet Strings is a play on words for Dulcimer. The dulcimer is sweet music with strings so Sweet Strings is a natural migration. 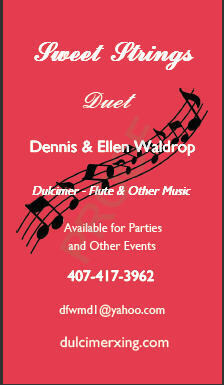 Sweet Strings is the name of our new Duo that my wife Ellen and I have formed to play together in public. We have been playing in two groups for a number of years and we decided we wanted to expand our playing in public as a duo. We love the mountain dulcimer very much and want to promote the instrument as much as we can. As we look for activities to do so the formation of a duo was a natural migration for us. On this page we will be promoting everything about music from pictures of dulcimers to youtube videos of mountain dulcimer playing to our duo Sweet String and provide information of activities and events we will be participating in. We hope you enjoy our musical journey as much as we do and hope you come along and maybe come out to hear us someday!